BYOC (bring your own case). If you like the idea of a standing desk but found Lian Li's DK-04 a little ostentatious for your tastes, you may prefer one of its newest models, the DK-12 or DK-16. Like the DK-04, these two new standing desks are motorized and designed to get you up off your rump. While there's conflicting information out there, many believe it's generally better for your health to stand at your PC rather than sit in front of it for hours on end. "It is true that people sit for most of their day, increasing the risk of diabetes and heart disease. With manifold health benefits discovered by prevailing studies these past few years, standing desks are a vogue choice for employers and office workers seeking to improve their habits and lifestyle. Many vaunt standing desks not only for health benefits, but even boosting productivity. With everything to gain and nothing to lose, why not start standing?," Lian Li proposes. Unlike the DK-04, there's no built-in case or transparent glass surface to see your components—the DK-12 and DK-16 are motorized standing desks, nothing more, nothing less. Stand while you work, sit while you game. Both desks allow you to save up to four height settings ranging from 69.5cm to 118.5cm using a small control console on the front. The DK-12 can lift up to 120kg and measures 140cm long by 70-75cm wide, while the DK-16 can handle loads up to 80kg and is a little longer and wider at 210cm and 75-80cm, respectively. Both are 3cm thick. There are a pair of circular cable passthroughs with metal covers on each desk to help route and manage wires. There's also a shelf where you can tuck cables or power bricks. Lian Li constructed its newest standing desks with a "leather-like" waterproof surface on a wooden frame mounted to an aluminum base. The steel legs are "exceptionally sturdy," Lian Li claims. 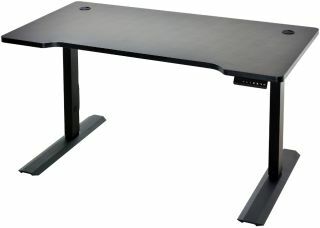 While less expensive than the DK-04, neither of Lian Li's newest standing desks are cheap. The DK-12 goes for $900 and the DK-16 sells for $1,100. Both are supposed to be available now at Newegg, though at the time of this writing, only the DK-12 is showing up.